Download The Infiltrator in Digital HD from the iTunes store. The Infiltrator images are © Broad Green Pictures. All Rights Reserved. It was the biggest drug bust in US history. A triumph for the Federal Government that took down over 100 drug smugglers in the Pablo Escobar Ring. For Robert Mazur (Bryan Cranston; Breaking Bad), it was a few years' worth of work living a double life and always being in danger. It was also bittersweet as he became friends with many of the people he helped put in jail. The Infiltrator takes a look at the investigation and complex game Mazur played to get all the way to the top of the Colombian drug cartel. Robert Mazur worked for US Customs in Florida, and in 1985, they were losing the war on drugs with millions of dollars of cocaine being smuggled into the country each month. With low level busts the norm in the department, it seems they would never get to the root of the problem. However, Mazur one day realized they were going about it all wrong, and instead of following the drugs, they needed to follow the money. Robert then creates an "alter ego", Bob Musella, and infiltrates the Cartel by laundering their drug money. Along the way he, his partner, Emir (John Leguizamo; Ice Age) and fellow agent, Kathy (Diane Kruger; Inglorious Basterds) embed themselves into the lives and businesses of these criminals at great personal risk. Along the way, they develop relationships with these drug dealers and actually do not relish the idea of sending many of them to jail. This is an all-star cast and Cranston is perfect as Mazur. He artfully navigates his way through the duplicity of this role with ease and expertise that reminds us why he is an Oscar-nominated actor. Leguizamo and Kruger not only compliment Cranston well, but fully embody their characters which makes their partnerships on screen all the more realistic. Benjamin Bratt (Law and Order), as Roberto Alcaino, is a nuanced performance. He has played this type of role before; but in this case, he shows a more human side to the high-powered drug dealer than we have seen from him in the past. I would be remiss if I didn't mention the fabulous Olympia Dukakis (Moonstruck) who only has 2 scenes but steals them both! The script is well written and has poignant moments, but I wish there was more time to develop the story, as I'm sure there is so much more that had to be left out of this complicated saga. Director, Brad Furman (The Lincoln Lawyer), does a good job of setting the tone and feel of the movie opting for a grittier look to help transport the audience back to the mid 1980's. He doesn't rely on quick cuts and explosive shootouts to fill the time on screen, but simply lets the story play out with the minimum amount of blood and gore necessary. The set designs and wardrobe also lend an air of authenticity to the whole movie. Knowing the film is based on real life events and even knowing the outcome doesn't make the movie any less suspenseful which, again, I attribute to Furman. 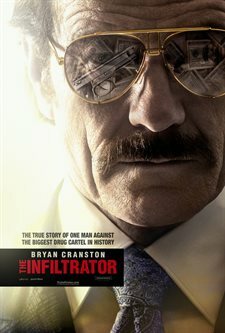 Well told, nicely paced, and beautifully acted, The Infiltrator, left me craving more at the end. I wanted to know all the details about those arrested, Mazur and his team, and how this bust impacted the overall drug sales in the US. Two hours of heart pounding, edge-of–my-seat excitement left me physically drained, but satisfied.